We’ve watched as advisors have used a variety of methods to share the Riskalyze insights and analysis they’ve built with their clients. We’ve had lots of discussion as an industry about the technology we can use to do this — from an office iPad you can hand to a client, to WebEx for sharing your screen. But those solutions are very challenging in the real world. People often can’t get the WebEx plugin installed in their browser, or find Skype in their downloads folder. The iPad keeps signing itself out, and you have to fiddle with passwords in front of the client. And if by some miracle the technology can get working, it’s still a high blood pressure experience — did I hide the email notifications? Am I pulling up the right client’s information? Am I showing the wrong data to the wrong client? We asked ourselves — what if this was easy? What if it was absolutely seamless, with no plugins or software to install, no passwords to remember, with bulletproof security and it just worked? Today, Riskalyze reinvents the client meeting. 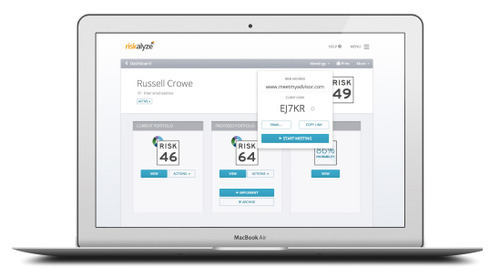 With Meetings built into Riskalyze, you can effortlessly launch a meeting with just two clicks. Your client only needs a web browser to join the meeting. It’s absolutely secure, and there’s no way to share the wrong data with the wrong client. Your clients can watch you manipulate portfolios and Retirement Maps, help them capture their Risk Number, or you can even beam a risk questionnaire to their device to fill out.